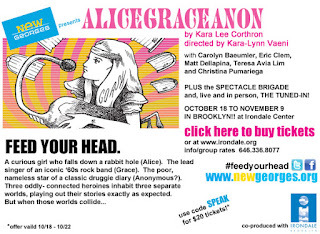 When she's ten feet tall..."
AliceGraceAnon is about three oddly connected heroines who each discover that their lives are in some way being authored by someone else. It’s also about friendship and taking steps toward self-actualization. Toss in 15 performers, a live band, an interactive installation, beer, and various elements of a 1960s-era happening and you’ll have the truest sense of what AliceGraceAnon will be. my early teens and it riveted and terrified me. 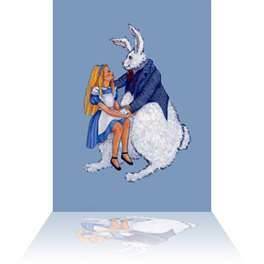 It was fear of that book and my obsession with psychedelia that led me to read the Lewis Carroll books. I was fascinated by the weird thread that connected these three phenomena: Go Ask Alice is taken from a lyric from Jefferson Airplane’s seminal acid-laced anthem “White Rabbit”, which was inspired by both Alice’s Adventures in Wonderland and Through the Looking Glass. 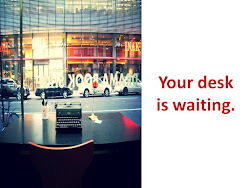 For many years, these three things have been intimately intertwined in my mind. So I think it’s safe to say that this play has been gestating in my head for a looooonnngg time. 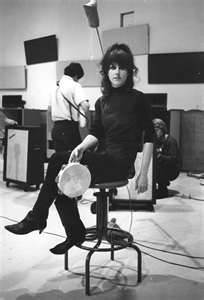 I always had the feeling that I’d create something inspired by Alice, Grace Slick (lead singer of Jefferson Airplane), and the Anonymous protagonist of Go Ask Alice. But I never seriously explored what that something might be. I thought “Wow. That would be a crazy mess!” But when Susan came to me back in 2010 with the commission, and when she stressed the idea that this should be my “dream play,” I figured if I’m ever going to explore this nutty concept, this is the opportunity. Can you talk about the title? I smooshed the names of the three heroines together and shortened Anonymous to Anon, because it sounded better. Super simple. Alicegraceanon was originally commissioned by New George's Germ Project, how did that commission come about? AliceGraceAnon was commissioned as a response to the shrinking of new American Theatre: the fact that new play casts are getting smaller and smaller and even the stages where new plays can be produced are literally being minimized around the country (this is discussed in eloquent and distressing detail in Todd London's brilliant book, Outrageous Fortune). In response to this trend, Susan decided to commission four plays. Four BIG plays. Four big, bold, adventurous, “un-producible” plays of grand scope. And she used a bunch of other exciting words that playwrights don’t typically hear from producers. And I’ve been a New Georges affiliated artist for several years so, Yeah. That’s pretty much the story. What was your process once it was commissioned? It was sort of a unique process at least compared to others I’ve experienced. Susan, Kara-Lynn, and I set up some deadlines early on. The first one was just for the first 15 pages. Even the process of putting this play on paper was unique. When I started, to make the play’s beginning structure of three separate worlds onstage clear, I wrote the play in Microsoft Excel (I eventually learned that Excel is the devil’s playground and had to make other arrangements). So even its appearance on the page was not the norm. We continued working like this and in December of 2010, we did the first rehearsed workshop. I think we worked and staged about 30 pages. In June of 2011, The Germ Project premiered. This was an evening of 20-minute excerpts or “germs” from each of the commissioned projects. AliceGraceAnon was performed with Evening All Afternoon by Anna Ziegler, This is Not Antigone by Kathryn Walat, and Goldor $ Mythyka: A Hero Is Born by Lynn Rosen. During The Germ Project’s run, on an Equity day off, I sat alone on our set at 3LD and finished the first draft of the play—well almost—all in that one day. This was a skeletal draft and after a few more workshops and deadlines and dramaturgical discussions, here we are. Where/how did you and Kara-Lynn Vaeni meet each other? Kara-Lynn and I have worked together on several projects since we first met back in 2008 when New Georges presented a mini-workshop of my play Holly Down in Heaven and Kara-Lynn directed. Susan paired us up for that and it was a pretty wise match. Doesn’t hurt that we have almost the exact same initials. Can you talk about how the space is being used and how that idea developed as well as the audience relationship/participation with it and the play? One of the coolest aspects of the Irondale is how big and old it is. We were instantly intrigued by the idea of using as much of it as possible. To that end, before the actual performance begins, there will be these interactive installations relating to our three main characters that the audience members can experience. Some things will be obvious, can’t-miss-it-type things. Some will be more of a secret. I can’t say more than that. But I can say that if people want to have fun with the interactive component, there will be plenty for them to do and if they’d rather sit quietly and wait for the show to begin, they’re totally welcome to do that, too. Aside from the awesome/fun aspect of playing with the space, we want this to be a chance to give the audience some background for these characters and how they’re connected. 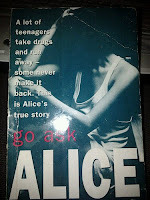 It’s probably most critical for our Anonymous character, the protagonist of Go Ask Alice. I had an early reading of the play with a writers group and none of them had read the book and some hadn’t even heard of it. Without any context, they had no idea what she was doing in the play. So I feel like this pre-show interactive bit is sort of our version of the standard program note. After AliceGraceAnon opens, I’m going to have some downtime for a bit, which is probably a good thing. In the winter, I’ll be heading back to Athens, Ohio to teach the rock star MFA playwrights out there. BUT my play Holly Down in Heaven is currently running at Forum Theatre in Silver Spring, MD until October 20th. So if anyone reading this is in/near the area, please go! The cast is a dream and the production is delightful. What was one of the most helpful things you were told or have learned about the business of being a playwright? Everyone’s path is completely singular. As singular as your voice as a playwright. Why is this helpful? Taken the wrong way, this can seem frustrating, but I’ve realized that it’s actually quite liberating. My career has nothing to do with anyone else’s. I don’t have control over how often my work is produced or how people will respond to it, but I can control the effort and heart I put into my work. I can say “yes” to those experiences that will support my growth as an artist and person and I can say “no” to anything that won’t. This business is mysterious; at times rewarding and at other times, painful. There are days when you will look at what someone else has and you’ll think, “that’s not fair,” because you’re human. There will be days when someone will look at what you have and think, “that’s not fair,” because they’re human. If you can remind yourself that your career is uniquely your own, it is so much easier to feel the gratitude you deserve to feel and gratitude leads to greater things. Trust me. Theaterspeakers get special $20 tickets for performances from October 18th - 22nd. Just click here and enter SPEAK as your discount code.